No matter how robust your HSIA system, your guests will require occasional technical support and your network will need regular maintenance. 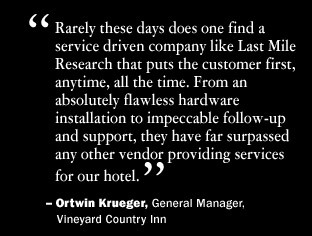 Managers of fine resorts and hotels entrust the care of their guests to Last Mile Research because we offer the industry’s highest quality support for HSIA systems. We assure an outstanding customer experience for your guests who have trouble connecting to the Internet. 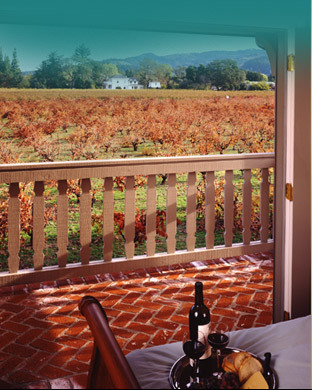 With Tier I Support, guests use a toll-free number to reach the Last Mile Research Help Desk. Our Help Desk team is incented to minimize answer time, hold time, and the mean time to troubleshoot problems. Typically, our service support engineers resolve your guests’ connection issues within a few minutes, which is why we have the highest percentage of successful resolutions in the industry. With Tier II Engineering Support, Last Mile Research remotely monitors every device connected to your HSIA network. In the event of a circuit outage or equipment failure, we will work with members of your staff to remedy the problem. In the event that we are unable to resolve the equipment issue over the telephone, a Last Mile Research engineer is immediately dispatched to your property to repair or replace the malfunctioning equipment. Our Tier I and Tier II support services will keep your guests connected and happy. That is why each of our clients elect to subscribe to both levels of service. And they’re glad they did. The Last Mile Research Help Desk also supports media devices, and are contacted through the same toll free number used for HSIA support. When a guest calls with a media center question, our tech support technicians use graphic images of the guest room and each component of the system to address questions and outages. Whether answering simple questions about recording a movie, or troubleshooting equipment malfunctions, the Last Mile Research Help Desk will save your on-site engineering staff countless hours, allowing them to focus on mission critical tasks.